I wanted to watch the sun rise through the standing stones on the winter solstice. In truth, the true magic was supposed to happen at sunset: the last of the day’s light beaming through the passageways of the southwest-facing cairns and spilling over the ancient dead like a gift, for a few precious moments in this one important hour every year, for four thousand years. But sunset in mid December was at 3.30 in the afternoon, and I knew we’d probably still be out. We had made plans to visit a tiny village close to Nairn, and walk ten kilometres though fields to see Cawdor Castle in the distance, the seat of my distant Calder relatives. Probably, I thought, we’d still be driving home at sunset. (We were). And the forecast was for rain in the afternoon, anyway. So we hurried down our breakfast and left in the dark, arriving just in time to watch the dawn instead, as it coloured the ancient wood in gold, and sent the fairies shimmering back into the shadows, seconds before the sun’s rays broke then burst over the nearby hills. My family wandered with me for a few minutes but then retreated to the relative warmth of the car, leaving me to explore the cairns and stones alone. For a little while, I pulled my gloves off and rested my fingertips on the ancient standing stones, letting the earth’s currents flow up through that quiet ground and the lichen-covered stone, then coursing into my hands and grounding my body in nature and history. Four thousand years. It’s an almost unthinkable age to me but, to our planet, those stones are little more than the passing acne of adolescence on the surface of time. The stones were sharp with ice, and smooth inside the “cups,” little circular dips carved out with stone or antler tools, patiently worked by human hands millennia ago. Hands just like mine, maybe even genetically related to mine, but on people leading lives so different to my experience it is impossible to fathom that which binds us. Except this earth. This dawn. These stones. They are our constant, linking me to them and them to me as though time did not matter and they had just - just - left, melting away into shadows with the fairies mere moments before I arrived with the sun. These ancient ancestors of ours positioned the cairns to catch the solstice sunset, and graded the standing stones around them according to astronomical axes. Those that face the sunrise are smaller and whiter, while those placed toward the sunset are larger and the lichen, when scraped away, reveals stones of pink and red. While I stood alone and watched, the morning sun pierced a cleft stone in the lonely field. On a whim, I stepped behind the stone and let the cut-light pierce and refract over my face, closing my eyes to the gold, and turning it red beneath my lids. What do you think it means, that split stone? It is not the biggest nor the most impressive of the standing stones that guard these cairns, but the cleft feels strange, not something you see in nature, and to me it feels like a question. Two almost identical pieces of stone, side by side, kissing at the base but pushing one another apart at the shoulders, creating unearthly shadows and bending the sun’s rays and creating a hard-to-pin-down sense of unease. Like listening to your parents argue in the next room. Our humanity unites us throughout the millennia. These stones are part of me and I am part of them. But what do they mean? The weekend before we left the village forever, they turned the Christmas lights on. I stepped out of our apartment in the twilight to go to the post office, and hadn’t taken two steps before the entire town burst back into light. Christmas trees on every corner glowed with colour, rainbow twinkle lights floated in swathes above the cobblestones, intricate patterns of light made snowflakes above crossroads, and every laneway seemed touched with magic. I raced back from the post office to call the family outside, and together we strolled through the wonderland, marvelling at each new discovery. It seemed as though almost the entire village had had the same idea, we were all, young and old, wandering the town in joy, and the streets were filled with the sounds of “Ooh!” and “Ahh!”, punctuated by church bells. It felt like a fitting farewell to this town that we had called home for almost four months. From summer to winter, we watched the town transition from full bloom (and full to the brim) to a kind of turning-inwards, resting and readying for winter, and every new face on our town has been lovely. In the summer, the streets hummed with tourists. 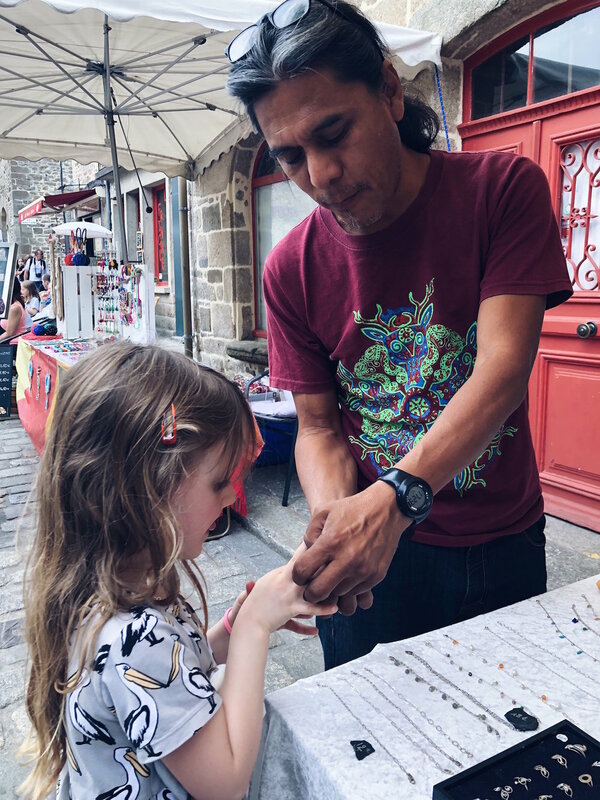 The glacerie did a roaring trade, with towering coronets of triple-flavoured home-made ice creams, and markets filled with handicrafts lined the street underneath the ancient clock tower, every day. A horse and carriage clopped underneath our window every hour or so, and a miniature train carrying retired German tourists chugged over the cobblestones all day long. We would wander down to the river in the sweltering heat, and sit on the stone edges with our feet in the water to cool off, or take a ride on the canal boat that took tourists to Lehon and back all day long (always telling the story, in two languages, of how if something happened to the horses pulling the canal-boats in the past, the captain’s wife would have to don a harness and drag that boat along the little river herself). On Wednesdays, the square beneath our window, in front of the ancient basilica, would fill with stalls of antique toys and books and curios for sale. Scout wore a hand-woven “love knot” around her wrist, woven by a local woman at the market. Ralph found a red tin van that had once held chocolates. I picked up a 300-year-old writing desk, and a hand-painted ceramic kugelhopf mould from a famous artists in Alsace. Everything in Dinan was alive. The geraniums in the pots outside our windows burst into extravagant colour, and the dancing light seemed to filter inside, even before dawn. There were jazz concerts in the square below us, sending music into our living room through the open windows until after midnight, while we ate crackers and cheese and sipped rosé, and I painted the memories of our grand adventure. And then the wind turned cold. As the seasons changed, so did the village. The glacerie closed its shutters for the last time in the year, as did our favourite boulanger, and many of the shops and restaurants taped handwritten signs to their closed shutters: fermé jusqu'en décembre (closed until December). It was a lot easier to move around the town without the crowds, and the children never had to wait for a space on the tourniquet in the playground, and the cafes and bistros that did remain open started selling vin chaud (hot wine). The breeze picked up, and the trees changed colour. Gold dominated, but there was also brown, orange, and crimson in the mix. On windy days, the sky would rain colour. We collected conkers and walnuts, and roasted found chestnuts. The chemin des pommiers (apple path) below the castle walls was slick with fallen, rotting apples, a picturesque death-trap to any who ventured down that steep slope. I walked the children to childcare in the golden glare of sunrise, and home again in the dark. On days off, we started frequenting a deli where the paninis were particularly good, and the proprietress was super-friendly towards the children. In fact, everyone grew friendlier, now that the throngs and crowds had melted away. And then one dark afternoon, they turned the Christmas lights on. I believe in the magic of forest paths that lead to unknown places, and ancient oak-trees with roots that reach so far into the earth that they touch history. I believe in the magic of red-and-gold leaves that fall like rain, the crunch of them underfoot, and the sound of wind like whispered promises. I believe in the magic of afternoon light that is actually gold, mist in the morning like a blanket, and the smell of woodsmoke in the air. Of mulled wine and hot chocolate, sipped in cafes with fogged-up windows and friendly strangers. The call of owls in the night, carrying across still water. I believe in the magic of standing in a place of legends, the very spot where, at some point in the 5th Century AD, a Briton named Arthur once spearheaded a resistance against invaders from the north, and inspired more than a thousand years of stories. Stories of love, of betrayal, of heroics, of swords, and stones, of witches, and warlocks, of knights, of round tables, of grails, and of kingdoms that unite and endure. And of a lady in a still and silent lake. We first noticed it on a Saturday night at the beginning of September: the unnatural quiet. We were returning from the playground, where the children had spent a rousing hour-and-a-half making friends via a game of Ralph’s invention. It involved tossing his soft car-toy into the midst of a group of children who were spinning at top speed on a merry-go-round. If they managed to catch it, they’d toss it back, causing gales of laughter as Ralph ran hither and thither to pick it up like an eager puppy. Over time, the game evolved into chasings, with everyone chasing the one person who held the car, which they’d then pass to someone else if the mob of children got too near. A bit like under-six football, only with a lot less rules. We left the playground and sat down at a table outside a restaurant in the heart of town. I ordered us a tuna salad to share, and a glass of wine for me, and leaned back to enjoy the evening. That’s when I noticed it: the quiet. The town, which we had left two hours earlier bustling with the now-familiar throngs of thousands of tourists, buskers, market stalls and families, was now all-but empty. Two old men at a table nearby, smoking over pastis. The woman from the Presse across the square, leaning in the doorframe of her shop and watching the dusk. An old English sheepdog, asleep on the flagstones. That was pretty much it, other than us, and it felt uncanny, to say the least. I said as much to the woman who brought us our salad. “Oui,” she said, her face widening into a broad smile, “c’est tres tranquil!” (“Yes, it’s very quiet!”). In the space of one afternoon, the school holidays had ended, and the crowds had melted away like mist in the sun. Now, I thought to myself, I am about to discover what life is really like in the village. And one great lesson I am learning from life in this village, now that tourist-season has closed, is that there is a time and a season for everything, if only we learn to listen for it. At first this felt restrictive because, in Australia, we are used to doing all the things, all the time. We eat when we can (hungry or not), and often on the go. We work all the time. Early morning. Late nights. Weekends. My husband brings his computer, iPad and telephone with him on holidays. We do our shopping at odd hours, slotting it around our long days. Pick up this on the way home from the office, grab that on the way home from school, shop for those at 9pm on a Sunday night, and order the rest online at 1am on a Tuesday after finishing a deadline. I get my coffee take-away and eat at my desk, and our mealtimes are likewise scattered. For breakfast, Mr B grabs a banana for the car and snacks at work when he gets hungry. Often I forget to eat lunch and then pick at unhealthy anythings scavenged from the pantry all afternoon. I feed the kids their dinner and put them into bed, and then by the time Mr B gets home from work I’m often too tired to cook again. We are keeping Uber Eats in business. * The church bells ring at seven in the morning. They don’t start earlier and the inference is, what person in their right mind would get up before seven in the morning anyway? As you can imagine, we came unstuck at first. I used up the last of our milk on a Saturday night and shock! horror! Had to wait until after ten on Tuesday morning to buy more for my tea. More than once, I failed to buy enough fruit and vegetables at the markets and had to go without for the rest of the week. 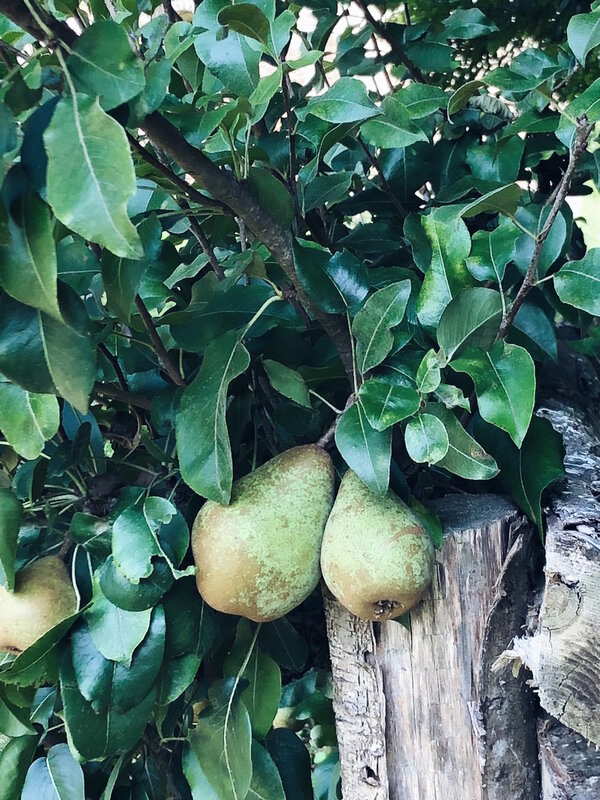 (Going without is better than facing the prospect of picking through the genuinely-rotting ‘fresh’ produce in the local supermarket to find something edible. I’m not kidding: if the supermarket was a cartoon, there’d be little wiggly smell-lines wafting above it). 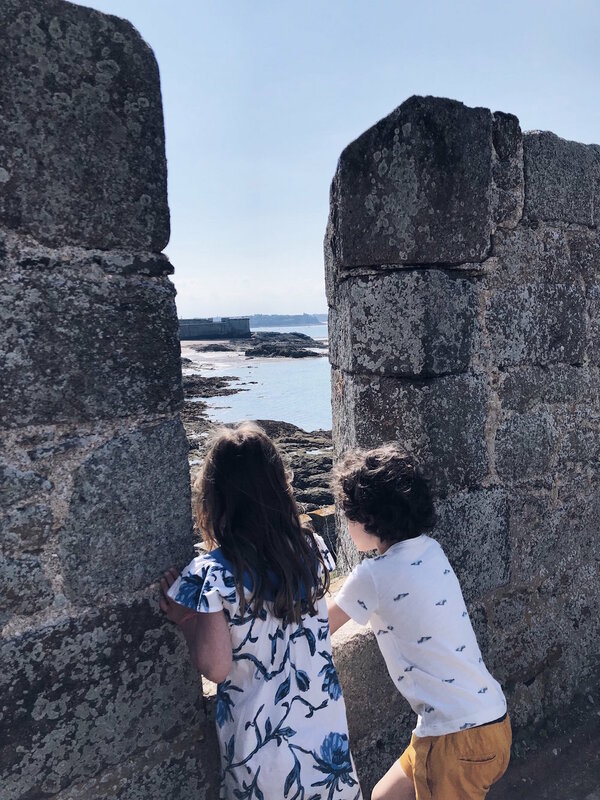 When we first arrived, my kids’ little tummies were used to having lunch at eleven or thereabouts, and we roamed fruitlessly from café to café, searching for something that was open before noon. We had the same problem when I wanted to take them out for dinner, but nobody would serve food until after their bed-times. But as time has gone by we have slowly adjusted to these new rhythms and, somehow, they are beginning to make profound sense. I take menu inspiration from what’s fresh at the market, rather than arriving at the supermarket with a ready-made list and very little idea of where my food is coming from. When it’s time for coffee, I take five minutes to sit at a cafe and people-watch while I sip, noticing and appreciating the taste… and the moment of peace. Mealtimes are for proper meals, and we enjoy them thoroughly. But when mealtimes are over, we stop eating. I don’t snack any more, and I’m noticing the difference to my waistline. 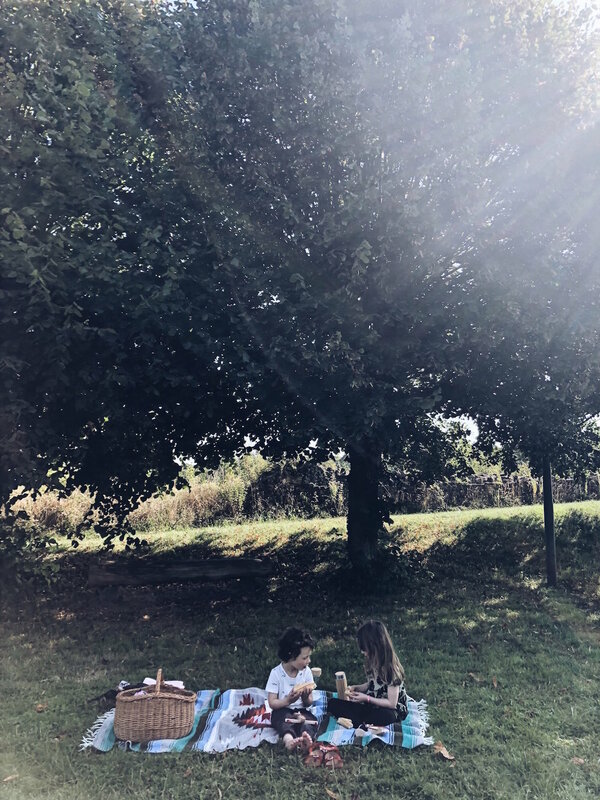 Sundays, when all the shops are closed, are for big cook-ups for the week ahead… or for long walks and picnics if the weather is just too good to resist. It feels as though we are training our bodies to notice the rising and setting of the sun, the rhythms of the harvest, the turning of the globe and the changing of the seasons. I am storing these life-lessons away, tucking them into my suitcase alongside the souvenir biscuit tins, vintage ceramic jelly mould and new winter coat that I also picked up here in France, in the hopes that they can be woven into my daily life when we return to Australia. Brace yourself: your day will probably have to start with the Paris Metro. Hold on tight to their hands, try not to inhale too deeply, and, if it’s peak hour, leave enough time to allow a few over-crowded trains to go by before you venture on in (here is a fun guide to surviving the metro in Paris). Take the Metro to somewhere close to a tourist attraction. I know, I know, you’re cooler than that. You want to explore off-the-beaten track alleyways and hole-in-the-wall one-dish-only Michelin star restaurants only Parisians know about. But you only have one day, and you are travelling with small children. There’ll be places they’ve seen in movies or read about in books that they are just desperate to visit. My friend, you are going to the Eiffel Tower! The goal is that you emerge from the dark, smelly Metro-cesspit and watch your kids’ eyes grow wide and hear them breathe “Wow!” as the true beauty of Paris rises all around them. That “Wow” is worth a thousand super-cool secret bars, trust me. Get yourself out of that Metro station, and look around. Wherever it is you emerge, it’s a fair bet it will be beautiful! Let the kids stretch their legs, and take a ramble over and around wherever it is you’ve decided to start. (For my kids, this means racing around the forecourt at The Louvre). Now find a nearby cafe and prepare to overpay outrageously for a coffee and a croissant. It’s worth it. The kids are hungry, and you’re in Paris. Order them a pain au chocolat and they will be over the moon. (Remember to use the loos here because you’re going to hit the road again soon). Look around for a hop-on-hop-off bus and buy yourself a day ticket. These buses are a fantastic way to look around a city if you don’t have much time. They hit all the top tourist destinations and the name pretty much says it all: you can hop on or off all day, using these buses to make your way around the city. If you’ve emerged at any of the places I listed above, a hop-on-hop-off bus will be nearby, so just grab the next one: this is how you’re going to get around for the rest of the day. Sit upstairs if the weather is fine. Especially if your children are quite young, the hop-on-hop-off bus will work with their moods. Do their little legs need a rest? Hop on the bus and drive around, seeing the sights while giving them a break (bring snacks if you need to). Are they growing restless? Jump off at the next stop and let them explore - another bus will be along whenever you need it to continue on your journey. Now let the kids set the itinerary. As you drive past the bouquinistes (those green market-stalls along the Seine), tell them about the antique postcards and books and trinkets they can find there and, if they like the sound of that, get off at the next stop. If Notre Dame fascinates them, hop off there, then take a walk to Shakespeare and Company afterwards. Or if they are art-lovers, hop off at the Musee d’Orsay and visit all those lovely impressionists. (Notre Dame tip: you can book online to climb to the top and skip the lines. Musee d’Orsay tip: book your tickets online to skip the queues). Let’s face it, assuming you do let the kids take charge, at some point or another today you are most likely going to the Eiffel Tower. (If you definitely know they’ll want to do this, try to make the Eiffel Tower your first stop, because the lines only get longer as the day goes on). Hop off the bus, and prep the kids. Tell them that yes, they can climb it, but it is a long way up, and there’s no changing their minds half way. Would they prefer to take the lift? (If you like, you can buy a ticket that allows you to walk up to the first level, then take the lift to the second. You can choose to take the lift back down as well). Half an hour later, ask incredulously, “Are you sure? ?” when your 4yo and 6yo declare that they want to climb both levels. Now moan and pant behind them as they set a cracking pace ahead of you, and you follow as best you can, carrying all the bags and coats they shed along the way. Have a tarte au pomme or a hot chocolate at the top. You’ve earned it. When you need a break from exploring, hop off the bus near one of Paris’ many beautiful parks. Take a breather here, and let the kids race around if they need to, or lie in the grass and make shapes out of clouds if that’s more your speed. If the weather is hot, float a paper boat in a pond, or let them dance through sprinklers to cool off. Optional extra: after receiving a thorough soaking from the sprinklers, allow them to treat you and half-a-million other tourists to a dance performance on the Trocadéro to dry off. (Oh yes, they did). Or bring a change of clothes. Ride a carousel. Buy crepes from an outdoor vendor and eat them for lunch under a tree or beside the river. Hop back on the bus, and visit as few or as many more sites as you want to. 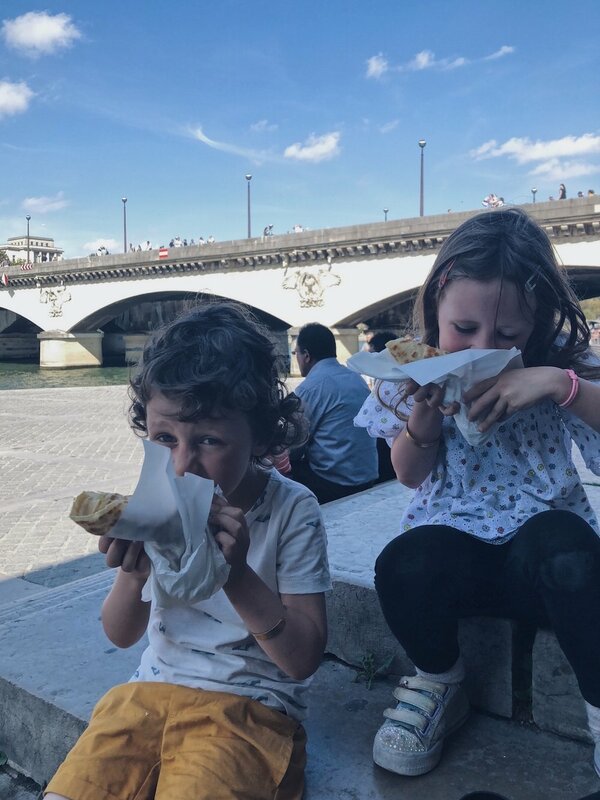 When you’ve had enough, hop back off at Notre Dame, and take a short walk along the Seine and over the bridge to the picturesque Ile St-Louis, to enjoy a cone of the best ice cream in Paris, from Berthillon. It’s seriously worth it. Sit in the gutter if you have to. You’re not shy. How is your energy? Are all of you flagging? If you have the stamina (or if you have a spare morning the next day), take the Metro once again, up to Montmartre. The closest stations are Abbesses (green line), Anvers (blue line) or Lamarck Caulaincourt (green line). If you’re not sure which way to go from the station, just head up hill. Depending on which direction you come from, you’ll either pass winding lanes with artists selling wares that spill out onto the sidewalk; or there’ll be buskers, hawkers, tricksters performing that old cup-and-coin trick, and way more pedestrians than cars. Each walk is equally fun. At the base of Sacre Coeur is a carousel that (joy of joys!) has two levels. This will make your children very happy indeed. When they’re ready to leave it, take the funiculaire up to Sacre Coeur (go in or not depending on their interest - it’s the actual funiculaire that they will love, and the cost is a standard Metro ticket price). Now walk around the corner to Place du Tertre for dinner. Choose one of the restaurants facing onto this lovely public square (once a favourite haunt of all your favourite artists) and order something delicious. I love moules-frites with a crisp rosé, but you do your thing. There will be loads of amateur artists wandering around, offering to draw or paint or cut portraits of you and your little ones, and selling landscapes of all the places you have visited and admired today. I know, it’s cheesy, and the likeness is not exactly the best. But what a great memento of your day in Paris with your family, having your children immortalised forever in the style of a mid-century-mod portrait. You could take a wander around and pick up a souvenir for not too much if you like, or settle in for that dinner and let the artists come to you. As dusk settles and the café lights come on, snuggle those tired kids onto your lap and ask them, “What was your favourite part of today?” They’ll tell you it was the ice cream, and the sprinklers. Stuff you could just as easily have done at home. There are cliffs at the edge of the horizon, behind the rocky island, so pale and misty they could be a mirage. I wonder aloud at what point the coast curves around, until somebody tells me that no, that is Jersey. The day is so clear that we can see all the way to the British Isles. We arrive just as the tide is drawing out, unaware of how lucky we are. Long stretches of golden sand, still rippled with the marks of the waves, unfold under our feet. We explore rock-pools, a waterfall, an infinity pool built into the ocean wall. 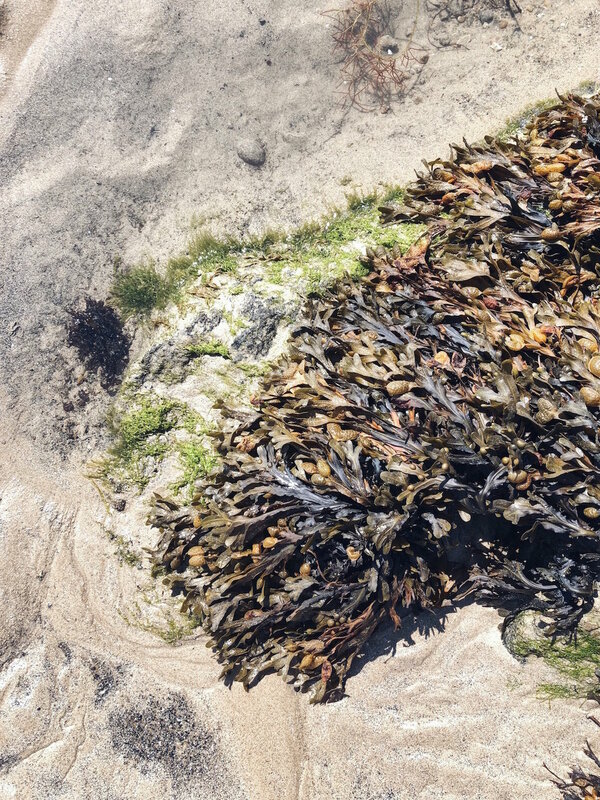 Gingerly we step between barnacles and in and out of patches of seaweed, making our way to a fort and prison on a hill. (Only a few hours later, there will be no beach at all, and the fort will become a wave-battered island.) Here are ancient walls, hidden rooms, and breathtaking views across to the castle walls and the old town. 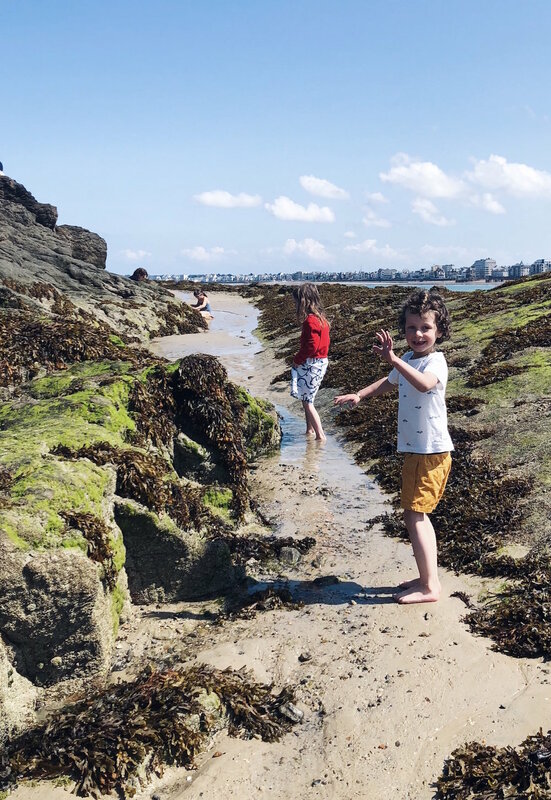 The children start the day in long pants and jumpers and slowly shed layers as the sun grows in strength, ending up gleefully racing across the sand and through the shallow waves in just their underwear. We plan to visit for two hours and stay for seven instead, barely making it to the last bus home, tired, sunburned, and overflowing with happy memories. As if to complete the cliché, seagulls circle above the castle towers, calling. I feel joy. Ralph chooses a random spot in the sand and starts digging. "Soon I'll find treasure," he announces, with supreme confidence. This is a place rich in history and beautifully, sometimes brutally, ruled by nature. 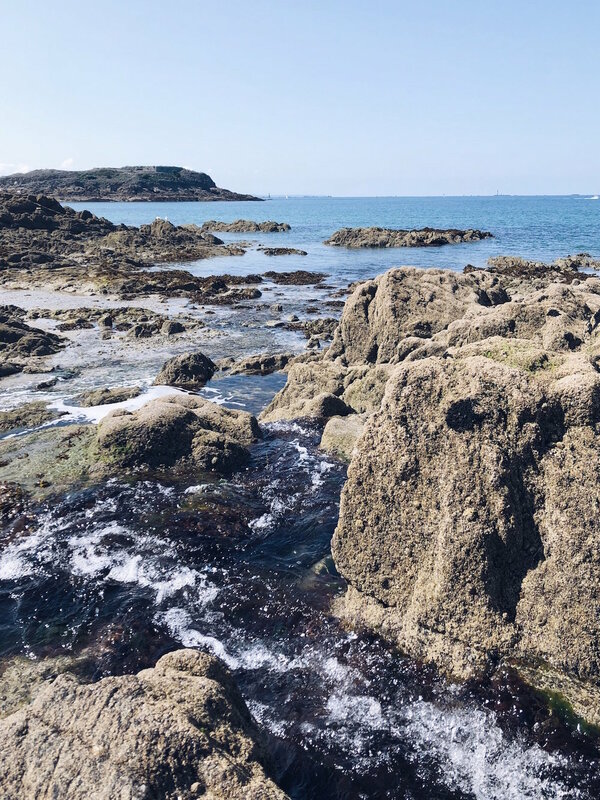 As we clamber over the still-wet rocks, Scout starts chanting to herself softly, "At our beach, at our magic beach..." from a well-known children's book we have at home. The book is about a beach that is beautiful and magical in its own right but, on every second page, the children in its pages imagine something more: knights battling dragons; an exhilarating underwater race on the backs of seahorses trailing pearls; smugglers, sneaking along the rocks at dusk. The book is called Magic Beach. We spread out our blanket in the shade on the grassy flat inside the ruins of the castle. All around us, birdsong. The paper-rustle of the breeze in the trees. The occasional, distant hum of a car bracing itself to climb the hill on the other side. And centuries. The sound of centuries. The vibrations of a thousand years, deeper than human hearing but as real as that bumble-bee we saw, drunk on pollen, staggering from borage to blackberry and back again. I take off my shoes and the grass is soft and warm beneath my toes. I want my body to touch the hum of the centuries, to see if they will touch me. "Are you grounding, Mummy?" asks Scout. That's my girl. The children kick off their shoes, too, and race about amid the wildflowers, shooting corks at each other from toy wooden crossbows. We pick flowers to press and, when the sun gets too hot, retreat into the shade for lunch. It is simple fare, but so, so good. Baguette from our favourite boulanger in town, soft cheese, pear and apple. And because I am still not entirely French, a thermos of hot tea. I stretch out on my stomach, kicking my bare feet in the air behind me, and read to the children aloud from Lunch Lady magazine. A story about the romance of caravanning in Australia. Scout says, "Let's stay here for the whole day," and I agree. Ralph discovers he can carry the corks for his crossbow inside the fat curls on his head. There is a plaque set near one of the ruined towers of the castle, that tells a little of the history of this place. It is uncharacteristically poetic for a plaque, and so beautiful that I search the small-print for an attribution of some kind. 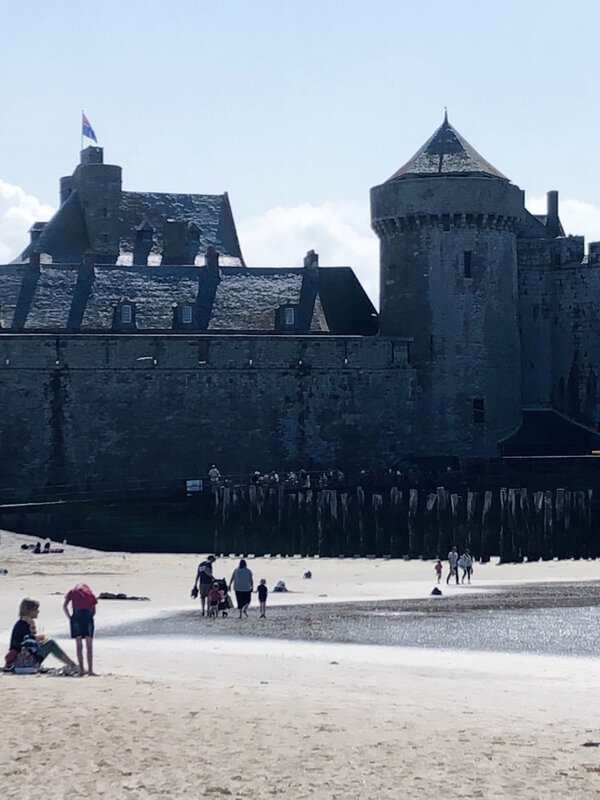 I feel as though I'm reading Victor Hugo, or Walter Scott, rather than someone from the Bretagne Tourism Office, circa nineteen-eighty-something. I'll share some of it with you. "For over a thousand years, the mighty castle walls dominated the banks of the river and echoed to the clash of iron and the cries of warriors. Now all is quiet on the deserted peak. Nothing is to be heard but the songs of the shepherds and the birds. The old feudal giant is nothing more than a meagre skeleton and each winter carries off a fragment. Only brambles and wild flowers inhabit the gaping ruins. Corn and apples ripen the orchard that once was a place of arms. Only the dew from heaven and the labourer's sweat now water this earth which warfare once drenched in blood and tears." There is a ticking clock. I followed the sound of it this morning as I tip-toed barefoot into the kitchen in a dark that was almost complete, aside from the soft, orange glow of one streetlight in the leafy square down below, filtering through the window. Tick tock. I tilted my head to listen more closely, and groped about in the dark for the object that was ticking. Held up to the faint light of the window, it revealed itself to be small, ceramic clock shaped like a teapot, and it said 5:40am. Good enough for me. I put the ticking teapot down, flipped the real kettle on, and opened the window to let the cooler air in. With my tea made, I sat down by that window and looked out over the square: there is an old church from which last night a choir of angels filled the air with song; a half-timbered medieval house across the way; and cobblestones around the silent square which, during the daylight hours, is bustling with people drinking and dining and laughing and smoking and talking: talk, talk, talking in snatches of French that I pick up here and there as they waft up to me in my third-floor eyrie, and it feels impossible that I am actually here. I think about this as I sip my tea. I want to take this opportunity, before the rest of the house is awake, to let the reality of this new life sink in. We have moved to France. Not forever, but for a fair bit longer than your average holiday. It is August right now, and we won't be home until New Year. We have an apartment in a village, and our goal while we are here is to simply and whole-heartedly immerse ourselves in life. We want to explore every inch of this village, on foot. We want to practise the language. We want to make friends. We want to eat the food and we want to learn to cook the food. Our village is pretty. Almost impossibly pretty, like a storybook. I didn't know this when I chose it: I simply googled towns of a certain size in the area we wanted to visit, and shortlisted them according to amenities like nearby hospitals and train stations (the reality of travel with kids). I can't even begin to share the knots of anxiety I had been experiencing in the lead-up to this trip (and oh! the late nights finishing my deadlines! ), and the journey here took two days and was genuinely gruelling. Nobody wants to see a four-year-old with bloodshot eyes from exhaustion, and still have to tell them "Sorry, Mummy can't carry you because of the suitcases." But yesterday as Paris gave way to fields and forests as our train sped on and on through deepening wilderness, my heart began to lift. Our stop: the end of the line. We clambered off and dragged those heavy suitcases and heavy-lidded children over the rough cobblestones, up and down laneways and in and out of crooked little streets, until suddenly we rounded a corner and an antique carousel was just beginning to turn. A hill beneath it swept down over ancient rooftops peppered with terra cotta chimneys, behind a riot of summer blooms. Pedestrians had taken over the road, the one brave car that appeared every five minutes or so being forced to inch its way tentatively through swathes of people eating ice cream. Scout turned to me with eyes like dinner plates and said, "Our town is amazing!" and I let out a deep breath I hadn't even realised I was holding. Our caretaker met us at the door with smiles and keys and a cornucopia of French bread, eggs, milk and fruit that I had asked her to buy for us. (Ralph bit into an apple and then it was his turn for those bloodshot eyes to turn into dinner plates: "It's a PEACH!" he announced, with the joy that can only be had by a fruit-loving boy who only two days ago was in winter, and proceeded to eat two at the same time, one in each hand). It will take some adjusting. At the moment, we still feel like tourists. The children, with Euros from friends burning holes in their pockets, bought woven bracelets and rings and money boxes and keyrings from market vendors in the streets, and there was no way I was getting them to bed without ice cream first, and a wander through the old streets and through the castle walls. In two weeks, though, most of the tourists will go home, and we will start to learn what life in the village is like when it is just a village. The dawn is starting to lift now, and the first of the birds are singing. A friendly cat just launched itself onto the windowsill and frightened the living daylights out of me. When my heart palpitations subsided I said "Bonjour," and it purred a greeting, before slinking off on whatever mission it had originally had in mind. The clock tower bell is tolling (very considerate: it didn't toll throughout the night, or maybe the bell-ringer just needed a sleep-in today). A few introductory higher notes and then a heavier, centuries old message: dong, dong, dong... seven times. And now I hear seagulls, drowning out the sound of the ticking teapot. Seven o'clock. Time to get the kids up. For the longest time, it felt as though I was alone in a post-apocalyptic world… all empty streets and orange-tinted street-lights and not. one. sound (not even crickets)… as I watched the moon turn slowly pink and Mars shone fiercely bright as only the god of war could do. Watching the blood moon eclipse unfold through the lens of my camera, the tall conifer trees at the back of the council building across the road gave the impression that we were somewhere rural, in the south of France maybe, rather than where I actually was which was a bus stop in an inner suburb of Melbourne, Australia. This impression was helped by the fact that no matter how hard I tried, there was so little light in the sky aside from Mars, which dominated everything, that every picture I took came out blurry, a little like a Van Gogh landscape with all those conifer trees. I shivered, adjusted the rug I’d draped around my shoulders for warmth, and moved the camera tripod a little to the right to position the moon between the trees again. Blood red. It sounds ominous, but it was the most beautiful sight. The cold moon washed red by all the sunrises and all the sunsets in all the world, happening at that exact moment. My moon, and yours. I stood there no longer alone, thinking about all those sunrises and sunsets and YOU in them, waking to coffee or driving home from work or sipping wine by the beach or making the beds or walking the dog or heading out with friends… all those things you were doing at sunrise or sunset in Auckland or Amsterdam, and everywhere in between. Not alone. “Can you see it yet?” a woman in a white dressing-gown and ugg boots raced across the road, face sky-ward, while a man followed after her, calling out. A child and a grown-up, also in dressing-gowns, hurried up the street I was on, pointing to the sky. A car came around the corner and the driver saw us, pulled over, turned off the headlights, and got out to watch. We all stood in companionable silence for a minute or two, and then the sunrise-sunset-moon slipped behind the conifers, and everyone drifted away, back to their warm homes. Somewhere, a magpie started to sing. I took a last sip of my thermos tea, packed up the camera tripod, and turned for my own home, too. Alone in the brightening sky now, fierce as ever, I’m pretty sure Mars shook his fist at me.